If you are a Pharmaceutical/Medical Supplier, Healthcare Equipment Manufacturer or Medical Software and Solutions provider, Blue Mail Media can provide you with one of the most comprehensive, accurate and reliable lists of physicians to strengthen your multi-channel marketing campaigns. 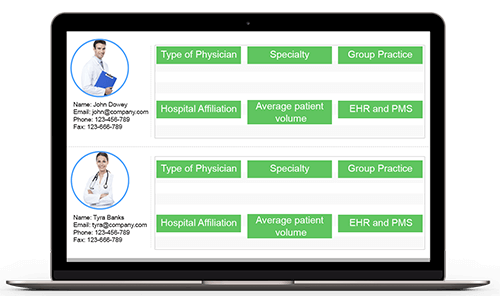 Our Physician Email List can connect you with over 900,000 physicians in the USA, UK, Canada, Europe and Australia. Our strong Physician Mailing List consists of accurate contact information collected from authentic sources such as directories, press releases, daily utility connections, new business filings, corporate websites, user-generated feedback, healthcare associations, medical publications and thousands of Yellow Page directories. We also provide the list of Physicians associated to the American Marketing Association. Our AMA physicians email list helps you connect with the best, recognized, and authenticated physicians in America. Our team of data scientists, researchers and analysts feed our database with newer information and remove discrepancies in a timely manner so that you can unlock seamless business opportunities in the heavily crowded healthcare market. Blue Mail Media’s Physician Email List is meticulously designed to enhance your interactions with your targeted customers and help you drive better response rate as well as conversions. You can avail Blue Mail Media’s pre-packaged Doctors Mailing List or you can opt for a customized list based on your campaign specific requirements.